I first came across the Machine at my local sewing group and liked the concept of a cutting machine to cut strips. If you upcycle fabric then it should be a more cost-effective way of using fabric for quilts than buying jelly rolls. Fabric can be cut on the straight of grain or on the bias. Portable, with storage case and handle. Long lasting forged steel blades due to the pressure action between blade and drum. It’s a simple action, almost like using a sewing machine where you use a foot pedal to operate and your hands to guide the fabric through the machine. If you watch this video by Simplicity you’ll see what I mean. With the Simplicity Rotary Cutter, it’s important to read the directions properly. It can be quite fiddly to get the blade set up for cutting fabric and it takes practise to get it right. To increase the cutting tension the screw needs to be tightened, this has to be done every time you change the fabric type being used, and you also need to unplug the machine for safety. It took a few goes with scrap fabric before the fabric was running through smoothly and the straight blade was cutting right through. To change the blade, you need a different screwdriver than for setting the blade height. It’s quite tricky as you’re working in such a small area, manual dexterity is needed. The pins need to be lined up correctly to make sure the rotary wheel is fitted correctly. There are many I’m afraid! The power cord is short making it awkward to position the foot pedal comfortably. You need 2 different types of screwdriver, one for adjusting the blade and one for changing the blade, a design flaw in my view. There is just one speed, fast, difficult to control for keeping the fabric straight. 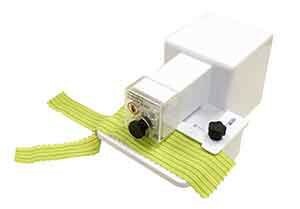 Fiddly to set up and no use if you have arthritic/stiff joint problems. You have to keep unplugging when adjusting cutting tension. Very tricky to cut accurate straight strips, the reason a quilter would want to buy it in the first place. If you’re patient and prepared to put some time in setting the Simplicity machine up then you MIGHT get some straight strips. When everything is aligned and you are 100% concentrating then it works as advertised. The Simplicity Rotary Cutter Machine sounds good on paper and is an affordable price, but there are better machines for the job, like the Sizzix or, if you have a larger budget then the AccuQuilt GO! Fabric Cutter If you’re thinking of buying the Simplicity Cutter because you have problems such as tendonitis or arthritis and think it might help, then don’t, this is not the machine for you. Thanks for the heads up. I want a machine that is going to make the work a bit easier and it sounds like the Simplicity Rotary Cutter Machine is only going to give me more! As well as a headache. No thanks! Really nice review! Very useful information about the Simplicity Rotary Cutter, I’ll bear it in mind.Thanks for this and I’ll check this back later. Nice site also. Hi, thank you for your honest review. I was quite impressed by the machine when I looked at the video, however, you pointed out some cons to the Simplicity Rotary Cutting Machine that I didn’t pick up on at all. So it’s not that simple after all. It’s not the most expensive cutter on the market, but I still wouldn’t like to spend $80 on something that only half does the job. Yes, the price point compared to some other fabric cutters is reasonable but, as you say spending $80 on something that doesn’t work too well is not what you want to do. Hopefully, Simplicity will take on board the feedback and improve their next Rotary cutter machine model. 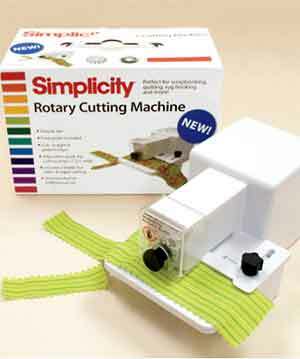 Thank you Kathy for a very thorough and comprehensive review of the simplicity rotary cutting machine. I am glad I made it to the bottom of the page for your conclusion, the video nearly had me placing an order. Yes, I have to say it this fabric cutter was disappointing but a manufacturers videos can make it look easy to use!I tried to be fair, it does have some good points and with a few design modifications could be much better. When I first saw this I was quite excited about it, but the more I read about, it the more put off I am. Shame, it’s a great concept. I am so cack-handed and any tool that can do the fiddly things for me is welcome in my home! Are there any alternatives that you can recommend, Kathy? 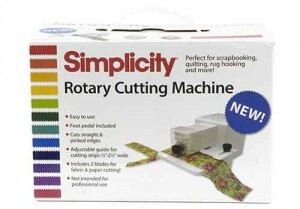 Does anyone know where I can get a free manual for the Simplicity Rotary Cutting Machine, Model 881950? Thanks. I have had one of these ‘things’ for a number of years and have never liked it—-except for the first day or two. It has never cut anything, including paper. I would NOT buy it again.